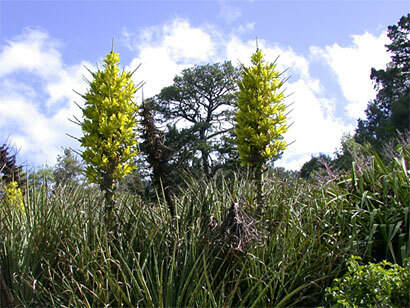 These are hardy ground bromeliads from the montane areas of Chile. They produce bloom stalks in spring up to 15 feet with these incredible flower colors. 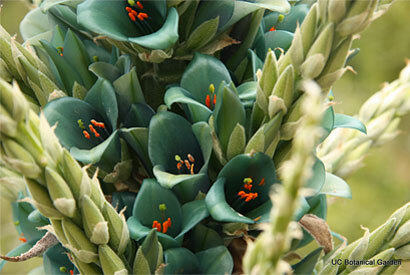 The lime green one is Puya chilensis and the more fascinating teal one is Puya berteroana. What looks like spikes sticking out are actually sterile flower spikes which serve as bird perches. The birds drink the rich and abundant nectar in the flowers. They are now in full bloom in our South American area immediately below the Garden of Old Roses. This is incidentally a great place to have a view of the Golden Gate Bridge: we are the only botanical garden in the world with a view of the Golden Gate Bridge.